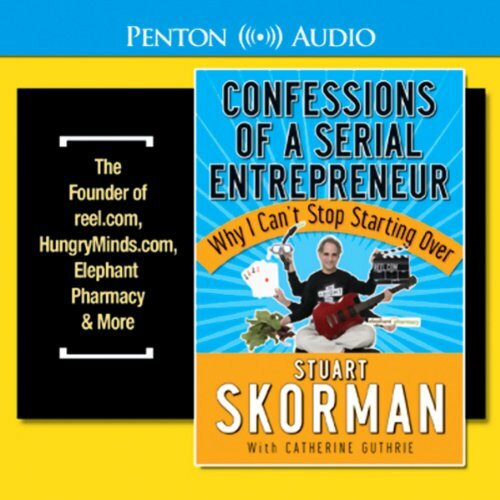 Entrepreneur Stuart Skorman, the founder of Elephant Pharmacy, Hungryminds.com, Reel.com, and Empire Video, grew up in a retailing family in Ohio. He worked every kind of job, from cab driver to professional poker player to CEO. In this entertaining, personal account of his coming of age in the business world, Skorman gives an insider's view of what it takes to start a business from the ground up. Stuart Skorman offers his hard-won lessons in business for any entrepreneur or small businessperson who wants to create a company that has a heart and soul. He reveals what he learned about marketing while working a stint as a rock band manager and bares his soul about his failure during the dot-com bubble. He describes in vivid terms the roller coaster ride of the entrepreneur in good times and bad, and explains how to survive in today's uncertain business environment. ©2007 Stuart Skorman (P)2007 Penton Overseas Inc. This is a good book. No revelations but mostly what I would consider an Entrepreneur's support group. Yes, there are items for those wanting to own their own business but the resounding wisdom is discovered when you too are a serial entrepreneur! This should be required reading for all entrepreneurs! I have read dozens of business books and recently graduated from a top business school and I can honestly say that I did not come across any authors/profs that give you the inside look and practical, applicable knowledge that is essential for entrepreneurs to succeed the way that Stuart Skorman does. I HIGHLY recommend this book! As a budding entrepreneur I thoroughly enjoyed listening to the book. It was great validation and encouragement for some of the experiences I've had in my nascent entrepreneurial career. One shouldn't be dissuaded by the mixed reviews from those looking for a "how-to" book. I think the book delivers just as advertised. It's a "confession". To me it's less how-to and more "Chicken-soup for the Entrepreneurial Soul". This book may be helpful to High school student interested in business, but if you have any experience in the real world it lacks substance. Just as things start to get interesting he changes the subject. It feels like the author is holding back. Great learning from a well experienced entrepreneur!! Great learning and advice from both successes & failures, but more importantly - the lesson! Very insipiring, but at the same time very realistic and applicable! Love it! This book stinks. All he does for 3 hours is toot his own horn. He never tells you if any of the businesses he started are successful or not, he just tries to tell you how great he thinks he is.